Pope Francis says Lionel Messi is not God but also admits to taking “joy” from the ability of his fellow country man Messi and eager to point out that the Barcelona talisman “is not God”. Many of football fans see's Lionel Messi to be a sporting deity, with his achievements raising the bar of individual excellence. 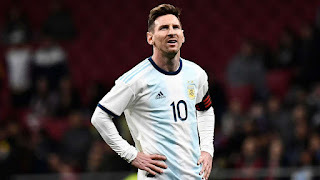 Asked by Spanish television show Salvados on La Sexta whether such a billing for Messi could be considered sacrilegious, as it breaks the third commandment by using the Lord’s name in vain, Pope Francis said: “In theory, it's a sacrilege. “You can't say it and I don't believe it. I think people say ‘he is God’ just as they say ‘I adore you’. You have to adore only God. “It's expressions that people use. Pope Francis has been known to be a football fan.